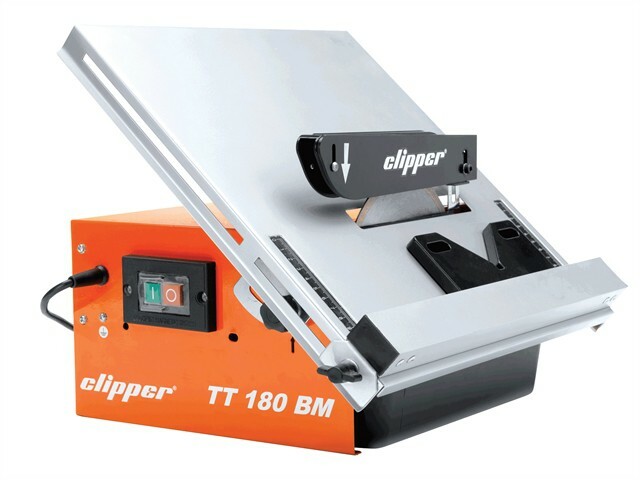 Flexovit Clipper TT180BM 180mm Water Cooled Pro Tile Cutter is a light but powerful table top tile saw that is easy to transport and is supplied with a protective carry case. The tile saw has a removable plastic water tray for easy cleaning and water filling, the tilting table allows for perfect mitre cuts from 0° to 45°. Table is constructed from steel with protective coating to the top to help prevent rust. Diamond Blade Size: 180mm x 25 Bore. Cutting Depth: @90°: 34mm, @45°: 24mm. Table Size: 395 x 385mm.